Vietnamese compressed watermelon sashimi. 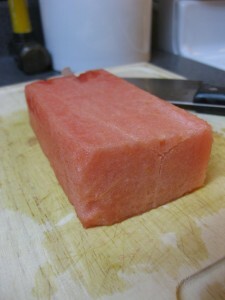 That’s watermelon, not tuna, pictured below! Compressed watermelon is made using a chamber vacuum sealer. 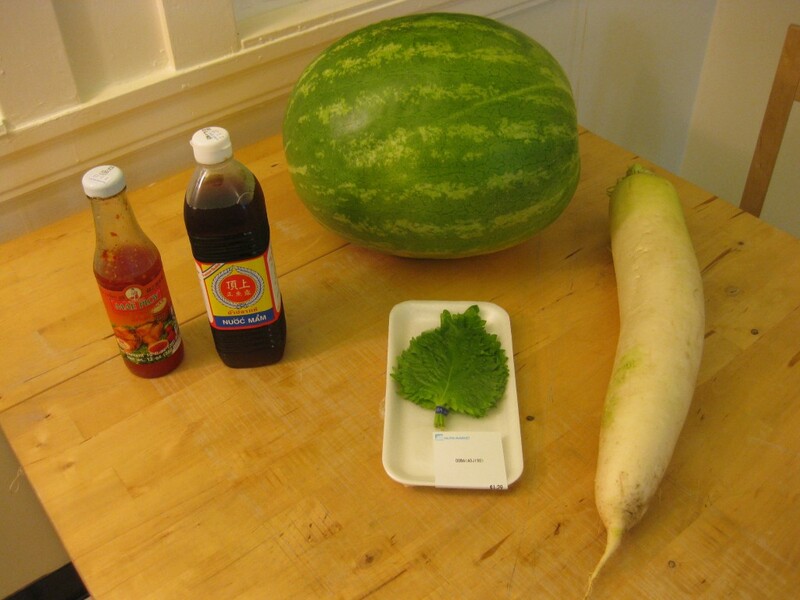 Under vacuum, the vacuoles in the watermelon cells expand like a balloon and eventually burst. 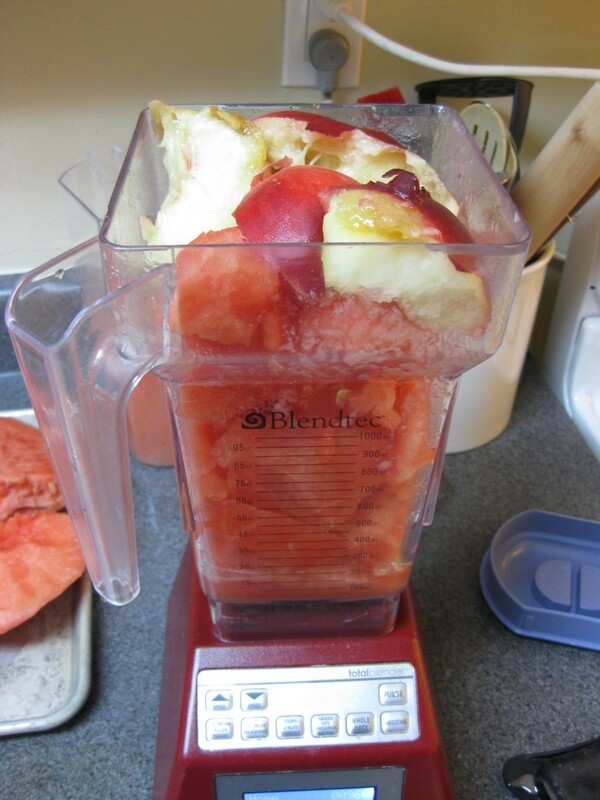 After the watermelon is sealed and the vacuum is released, the liquid in the bag fills the ruptured vacuoles, transforming the texture, color and flavor of the watermelon. 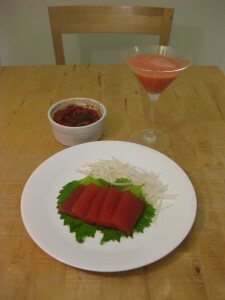 It becomes darker, denser and more flexible, looking and handling like raw ahi tuna; hence compressed watermelon sashimi. 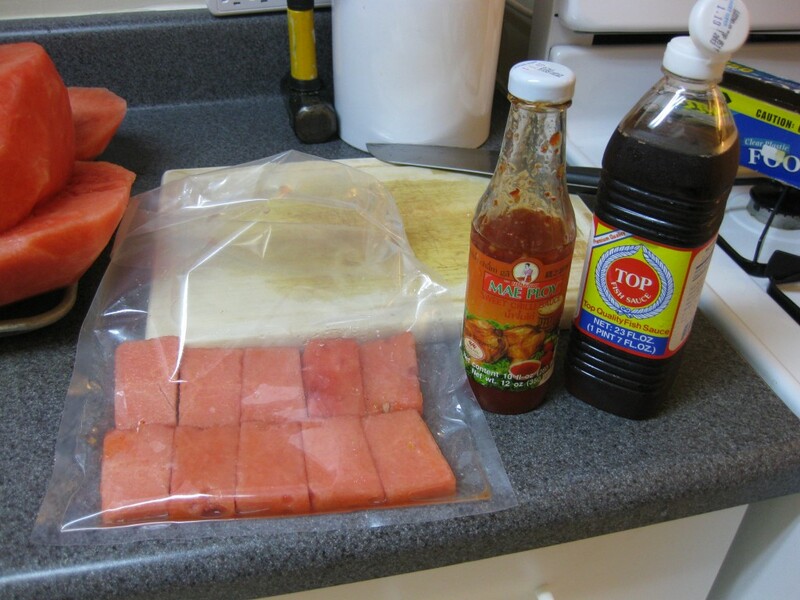 This dish has a Vietnamese twist because I added Nuoc Cham Ga and fish sauce to the bag, infusing the watermelon sashimi with a bit of spice and fish umami flavoring, as described here. This transforms the watermelon from sweet to savory, making it suitable as an appetizer. I used some of the leftover watermelon to make compressed watermelon brulee and watermelon-peach juice. 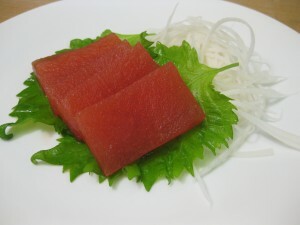 The Japanese have specialized techniques for butchering a fish for sushi. I believe analogous butchering methods are necessary to produce the highest quality watermelon sashimi. 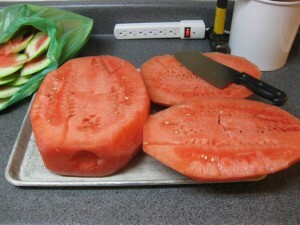 We’re after the “watermelon tenderloin” – the sweetest, seedless part of the watermelon right in the center. Instead of cutting a watermelon in half in the usual fashion, begin by cutting the ends off. This provides a flat base to stand the watermelon up vertically. 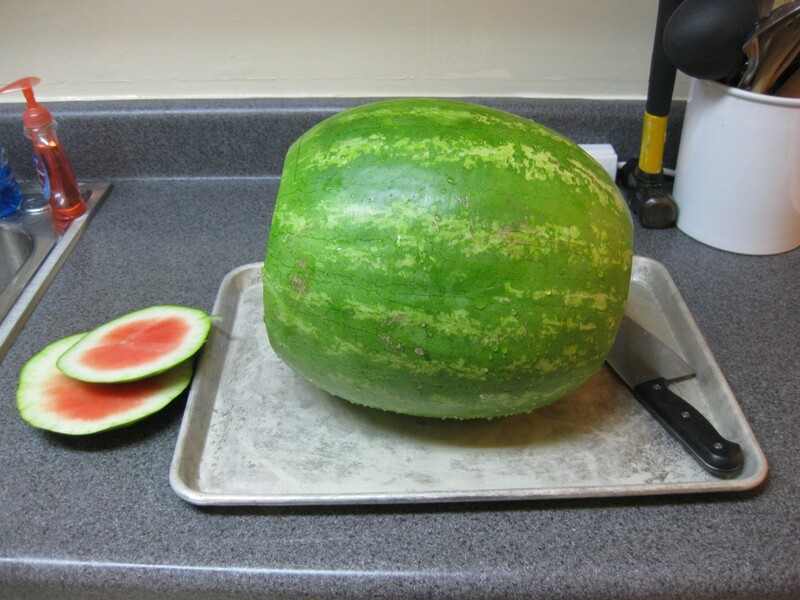 Slice off the rind, exposing the whole watermelon. 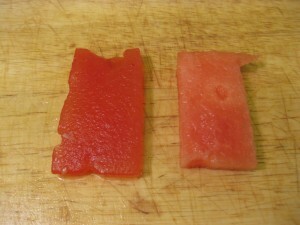 I wasted the rind; next time I think I will try making instant pickled watermelon rind using the chamber vacuum sealer. 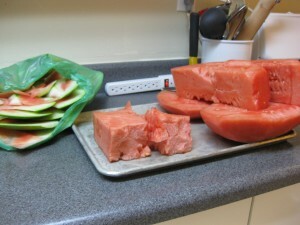 Next, chop the watermelon into thirds, lengthwise. Reserve the two rounded parts for later. 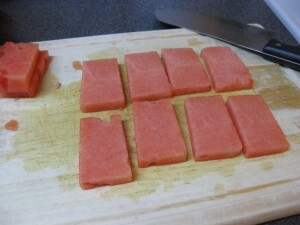 Cut the thick watermelon slab into thirds again. Again, reserve the rounded parts. We’re left with a rectangular block from the seedless inner watermelon core. Mine broke in half. 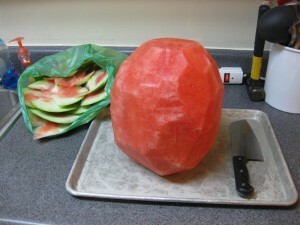 Trim the watermelon core into a steak so the edges are about 2.25″ x 1.25″. Slice the steak into sashimi about 0.25″ thick. Place the sashimi into a vacuum bag and add the Nuoc Cham Ga and fish sauce. I added about 0.5 tablespoons of each sauce. Coat each piece with sauce. 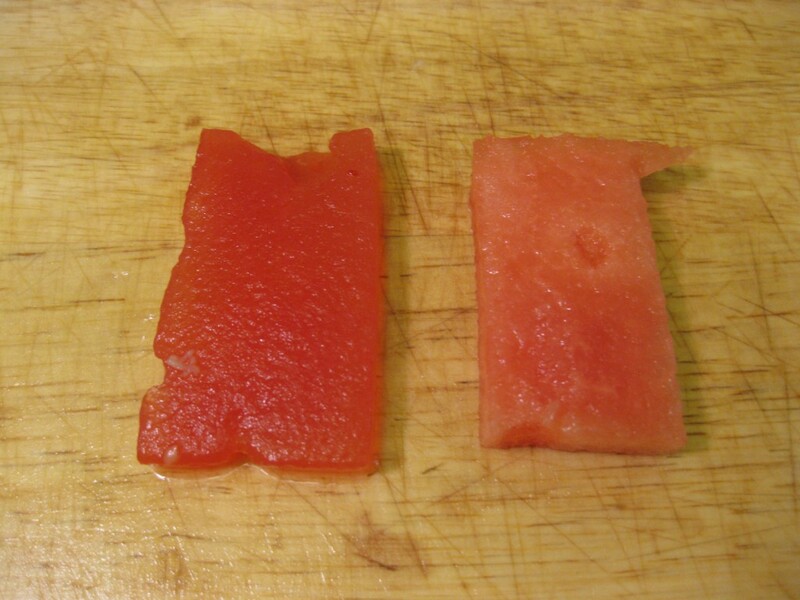 Here’s a comparison of the watermelon before (right) and after (left) using the chamber vacuum sealer. It really transforms the color and texture. Shred some daikon, garnish with shiso leaves. I initially made this dish with romaine lettuce in place of the shiso, but it’s worth going the extra mile to get the shiso leaves from a Japanese market to mimic traditional sashimi garnish. Shiso leaves have a minty flavor. Plain compressed watermelon loses some flavor compared to uncompressed watermelon. That’s why it was necessary flavor the watermelon with with Nuoc Cham Ga and fish sauce. 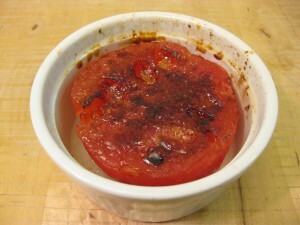 For dessert, we can compress a watermelon disk and make compressed watermelon brulee, adding flavor via caramelized sugar. 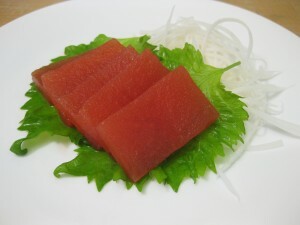 Unlike the sashimi, the disk can be cut from any part of the watermelon since it’s going to be topped with sugar anyways. For a drink, blend up the leftover scraps of watermelon with some white peaches. Here it is all together. The only thing that’s missing is a watermelon-themed main course. Overall, this is a good project because it’s simple (provided you have a chamber vacuum sealer) and the results are impressive, especially if you don’t know it’s watermelon ahead of time.